I'm available to take a limited number of speaking engagements per year. I don't have a brand, a schtick, or gimmicks. I assume my audience members are people of reasonable intelligence and good will. I assume if they're Catholic that, like me, they've embarked on a life-and-death-stakes adventure with Christ. I assume they have a sense of humor. I can speak to religious and laypeople, young and old, rich and poor, seekers of all stripes. I’ve had a conversation with the late, sainted Msgr. Lorenzo Albacete, led a staff Day of Recollection for Bishop Robert Barron's Word on Fire Ministries, and been a keynote speaker for the San Antonio Women's Conference, ENDOW, the annual Catholic Press Association Media Conference, and the annual Religious Ed Congress in Anaheim, CA. I’ve given talks for parishes in Omaha, NE, St. Louis, MO, Sioux Falls, SD, St. Paul, MN, Westwood, MA, New Orleans, LA, Pittsburgh PA, Monterey, CA, Phoenix, AZ, and throughout the greater LA area. I’ve given retreats on sobriety, Lent and St. Thérèse of Lisieux. I have a Letter of Good Standing from the Archdiocese of LA. I speak from my gut and my heart. What does it mean to be Catholic? What does it mean to live out the Gospels? One mark of the follower of Christ should be an expansive, wide-ranging curiosity. A discussion of how I’ve come to my own way of spreading the Gospel to the ends of the earth through my blog, books, photographs, weekly arts and culture column, daily Mass and walks. We invited Heather King for three different talks to various target audiences over three days. We laughed, we cried, and we marveled. Heather is as captivating and uniquely articulate in person as she is on the page. Her “voice” and vision are a treasure of our Church. Informed by gratitude for finding a place at the banquet of the Father, she has found a Daughter’s voice which women and men alike will find riveting, wise, humorous, and inspiring. For audiences seeking greater integrity in Christ, Heather is the perfect speaker. 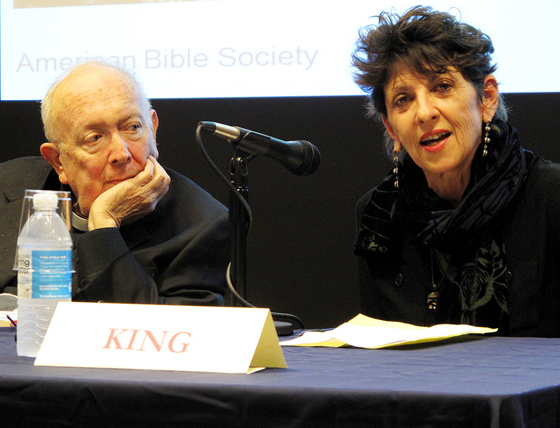 With deep insight, and joyful humor, Heather King’s keynote talk at the annual Catholic Press Association Conference was a provoking reminder. Each of us – especially those of us serving the Church as professionals in the media – are challenged to remember that the real deal is first and always, life with Christ. The writing and other work we do is a way to deepen that relationship. When Heather King speaks, what is heard out loud is what most of us are only willing to admit in the quiet of our thoughts: we are flawed, inadequate sinners and scared silly we will be found out! From her courageous honesty, we find our ourselves laughing and crying in our shared humanity and praising God that our failures are no match for His victorious Love and Healing. With a captivating authenticity, Heather shares a sad past of seedy bars, bad choices and distorted perceptions. I praise God for the blessing of Heather King; this ‘spark through stubble’ (Wis 3:7), fellow sinner and sister-in-Christ! Heather King touched our hearts deeply through her heart-rending, yet witty personal stories and the amazing lens through which she understands the writings of Thérèse of Lisieux. She summoned us to the true self-giving to which we are invited by Christ. Heather King is a member of the Catholic Speakers Organization, CatholicSpeakers.com.